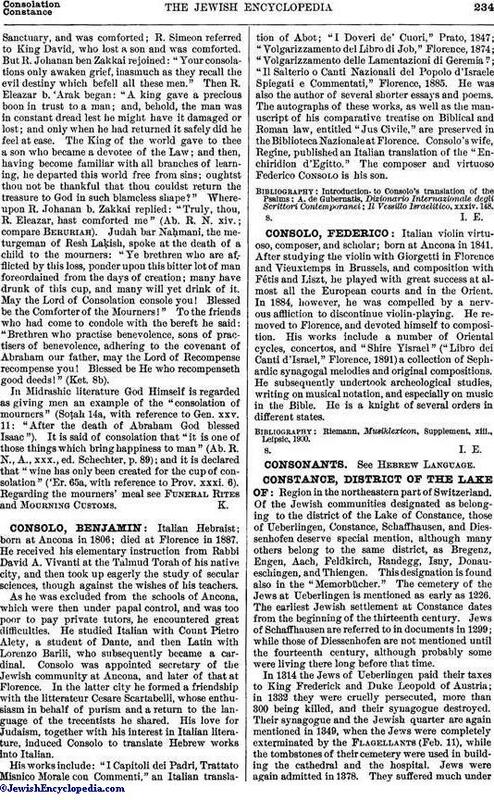 Italian Hebraist; born at Ancona in 1806; died at Florence in 1887. He received his elementary instruction from Rabbi David A. Vivanti at the Talmud Torah of his native city, and then took up eagerly the study of secular sciences, though against the wishes of his teachers. As he was excluded from the schools of Ancona, which were then under papal control, and was too poor to pay private tutors, he encountered great difficulties. He studied Italian with Count Pietro Alety, a student of Dante, and then Latin with Lorenzo Barili, who subsequently became a cardinal. Consolo was appointed secretary of the Jewish community at Ancona, and later of that at Florence. In the latter city he formed a friendship with the litterateur Cesare Scartabelli, whose enthusiasm in behalf of purism and a return to the language of the trecentists he shared. His love for Judaism, together with his interest in Italian literature, induced Consolo to translate Hebrew works into Italian. His works include: "I Capitoli dei Padri, Trattato Misnico Morale con Commenti," an Italian translation of Abot; "I Doveri de' Cuori," Prato, 1847; "Volgarizzamento del Libro di Job," Florence, 1874; "Volgarizzamento delle Lamentazioni di Geremia"; "Il Salterio o Canti Nazionali del Popolo d'Israele Spiegati e Commentati," Florence, 1885. He was also the author of several shorter essays and poems. The autographs of these works, as well as the manuscript of his comparative treatise on Biblical and Roman law, entitled "Jus Civile," are preserved in the Biblioteca Nazionale at Florence. Consolo's wife, Regine, published an Italian translation of the "Enchiridion d'Egitto." The composer and virtuoso Federico Consolo is his son. Il Vessillo Israelitico, xxxiv. 148.